As recently as a few days ago, The Washington Post reported that President Donald Trump’s pushback over being peppered with tough questions by members of the White House Press Corps resulted in newly installed Deputy Chief of Staff Bill Shine and press secretary Sarah Huckabee Sanders barring CNN correspondent Kaitlan Collins from an open-media event in the Rose Garden. The reason given, according to The Post, was because they objected to her questioning of the president earlier in the day. This represented the latest action (as of July 25) that Trump, his designees, and a growing number of his supporters across the country targeting a media representative in retaliation to them simply carrying out their constitutionally protected right and professional responsibility. Following the June 28 shooting at the Annapolis, Maryland Capital Gazette – which killed five and injured two other staffers – a growing number of Americans, members of the media, and political leaders including Senator Blumenthal have suggested that the constant berating and demonizing of the press by the president and legions of his supporters, “gives license” to those who might seek to do personal harm to journalists. 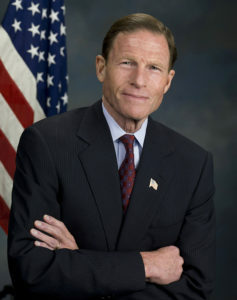 Scant weeks earlier, Blumenthal and Menendez introduced the Journalist Protection Act which, if passed, would make it a federal crime to intentionally cause bodily injury to a journalist affecting interstate or foreign commerce in the course of reporting or in a manner designed to intimidate him or her from newsgathering for a media organization. The senators believe the proposal represented a clear statement that assaults against people engaged in reporting are unacceptable, while providing law enforcement the legal tools to pursue and punish those physically interfering with news gathering. Sen. Menendez pointed out that over 200 years ago, America’s founding fathers had the foresight to recognize the importance of a free press to a fledgling democracy. The senators’ release indicated the bill’s introduction coincided with attacks on the media by the Trump Administration, that included barring of other CNN and AP reporters from a public event in late May with then-EPA Administrator Scott Pruitt, and forcibly removing an AP reporter from the building. “President Donald Trump’s conduct invites violence against journalists. It’s not just about labelling reports of his constant falsehoods as #FakeNews – it’s his casting of media personalities and outlets as anti-American targets, and encouraging people to engage in violence,” said U.S. Representative Eric Swalwell (CA-15) in the release. Swalwell is the author of the bill in the House of Representatives. In February, as Blumenthal and Menendez were in the early stages of researching for their bill, they learned that WPIX reporter Howard Thompson and photographer John Frasse were attacked by a bat-wielding man while working on a story in the Bronx, New York. They also got wind of an incident in July 2017, where OC Weekly photographers Julie Leopo and Brian Feinzimer along with intern Frank Tristan were assaulted by demonstrators at a Make America Great Again rally in Huntington Beach, Calif. In an August confrontation, they said a reporter was punched in the face for filming anti-racism counter-protestors in Charlottesville, Virginia. And a few weeks later, Joplin, Missouri blogger Randy Turner was similarly attacked after reporting about a federal sexual harassment lawsuit against managers of a Joplin Sonic restaurant. The Journalist Protection Act is supported by the Communications Workers of America (CWA) and by News Media for Open Government, a broad coalition of news media and journalism organizations working to ensure that laws, policies and practices preserve and protect freedom of the press, open government and the free flow of information in our democratic society. Joining Rep. Swalwell, Journalist Protection Act co-sponsors in the House of Representatives include U.S. Representatives Steve Cohen (TN-09), David Cicilline (RI-01), Grace Napolitano (CA-32), Eleanor Holmes Norton (DC), Andre Carson (IN-07), Debbie Dingell (MI-12), Darren Soto (FL-09), Ro Khanna (CA-17), Jose Serrano (NY-15), Bobby Rush (IL-01), Maxine Waters (CA-43), and Gwen Moore (WI-04). The NENPA Bulletin recently interviewed Senators Blumenthal and Menendez on their efforts to better protect journalists and the freedom to which they are constitutionally entitled. Blumenthal took the opportunity to respond to the following questions in person. Due to scheduling challenges on deadline, Menendez opted to respond via email. NENPA Bulletin: Do you recall whether you started becoming concerned with Donald Trump’s attitude and treatment of the press before or after he became elected President? Sen. Menendez: Even as a candidate Donald Trump’s rhetoric towards the press was alarming. Branding any negative story as ‘fake news’ is designed to undermine the public’s faith in the press, and is a page out of the authoritarian playbook. Sen. Blumenthal: I too, became concerned about this issue – significantly – before he became president when I observed assaults and threats to journalists. In fact, I spoke with some members of the press. Reporters, producers and editors who were increasingly concerned, especially after the incident in Virginia. And of course, under President Trump, calling the press the enemy of the people…giving license to the increasing intensity of criticism. When the history of this era is written, the heroes will be the judiciary who stood against the president, and the free press, which has told us so much about what the president is doing that he doesn’t want us to know. The difficult thing about assaults on journalists is, they may not always be covered because reporters are reluctant to be part of a story themselves. Thinking back to some of the worst experiences you have had with the press – do you ever recall wanting to try to kill a story, or publicly retaliate, criticize, or admonish a journalist for what they wrote, posted, or broadcast? Sen. Blumenthal: I began life as a low level summer reporter for the Washington Post, and generally have respect for the integrity of reporters. I have never sought, as far as I can recall, to persuade a reporter about doing a story. I’ve tried to correct facts I thought were mis-stated, and provide truthful responses. I view reporters as performing a very important independent function, underscoring independent is important. Sen. Menendez: Members of Congress have a love-hate relationship with the press and I certainly haven’t been thrilled with everything written about me. Nonetheless, I cherish the rights set forth in the First Amendment to our Constitution. A free press is integral to our Democracy and way of life, ensuring that public officials and other individuals are held accountable for their actions. Journalists need to be able to report the news without fear of reprisals, so I would never retaliate, criticize, or admonish a journalist for ensuring the facts are reported. Was there a defining incident that caused you to take that next step and draft a law to better protect journalists? Sen. Menendez: The attacks on the press over the past few years have been steadily building. Moreover the rhetoric coming out of the White House that seeks to discredit journalists is extremely troubling and only serves to embolden our enemies abroad and divide us here at home. When I learned about the Journalist Protection Act I thought it would be a good opportunity to shine light onto the issue. Sen. Blumenthal: There was a general series of incidents. I wouldn’t say one was defining. Did the attack and murders at the Annapolis Capital Gazette about a month after you introduced this proposal energize any of your senate colleagues to get behind it? Sen. Blumenthal: When Senator Menendez first introduced it, there was virtually no attention given to it. But a number of my colleagues are now looking at it, wanting to know how it will work, is it necessary? Good questions – there has certainly been more interest. Sen. Menendez: Unfortunately it did not. That may be due to the constant barrage of news we find ourselves under. I was pleased to see the public rally around the Capital Gazette and I think that speaks volumes. Americans value a free press and they especially value their local journalists. How did you and your senate colleague first coalesce around proposing the Journalist Protection Act? Sen. Menendez: This bill was first introduced in the House by Congressman Swalwell. Senator Blumenthal and I became interested in the bill following its House introduction and our staffs worked together to introduce the Senate companion. Sen. Blumenthal: We were talking about it on the floor of the senate, introducing this idea, and I said I was already pretty far along in drafting it and if he had any ideas about how to do it. Where does the initiative stand today? Sen. Blumenthal: I’m looking for Republicans to support it, as Bob Menendez and I are Democrats and we want to expand the level of support. So I’d say we’re at a preliminary stage. This one would go to the Judiciary Committee. It’s a long process. Very few bills go through the Congress in weeks, most often take months, and not uncommonly years. Sen. Menendez: The bill has been referred to the Judiciary Committee on which Senator Blumenthal sits. He and I will continue to work to garner support for the bill. How can journalists and American citizens who support their work play a role is seeing this proposed bill come to fruition? Sen. Menendez: I encourage the American people to call their Member of Congress and express support for the bill. They could also write letters to the editor of their local papers expressing support for the bill which would help build awareness. Sen. Blumenthal: Creating more awareness and attention is very important. Which is why I welcome journalists themselves being interested in it. The world has never been more dangerous for journalists, here at home and abroad. The incidents in this country are unfortunately and intolerably high. The President has given license to the worst instincts of some of the hate groups in this country. So bringing attention to the need for protection – the idea of making it a federal felony means the FBI investigating it – and raising the severity of the offense. I think it’s important to enlist federal resources in an investigation, the forensic evidence that federal agencies can examine. And sending the signal that journalists deserve and need protection. In closing, what message would you want to impart to the legitimate working press, not just here in New England, but across the country? Sen. Blumenthal: The longer I am in elected office and the longer I live, the more I appreciate the unique and precious importance of the free press in this country. The old saying ‘sunlight is the best disinfectant’ is more true than ever before when it comes to impropriety and wrongdoing in the government – at the highest levels. The press has uncovered conflicts of interests, improprieties involving violations of the emoluments clause of the constitution, we would have none of the facts without the reporting of the press. I guarantee much that we’ll learn about this Supreme Court nominee will come from the press doing the digging that is necessary. I firmly believe this measure, even if nobody is ever prosecuted under it, sends a message that we believe the free press should be protected against any threats, intimidation, any sort of physical assault that prevents them from doing their job. They have a job that has to be done or we will lose our democracy. Sen. Menendez: The work of the free press has never been more important. The Fourth Estate remains a symbol of freedom throughout the world. From the tiny newspaper in a rural community to major news networks to investigative reporters, the American people rely on the press to tell them the truth. Keep up the good work and do not be discouraged by the rhetoric coming from some of those who seek to discredit you. Previous articleWhat’s the ‘true threat’ to American journalism and democracy?